The Department of Agriculture and Land Stewardship's Pesticide Bureau 's eight investigator's completed on-site investigations for 251 pesticide misuse complaints across the state of Iowa in the 2018 crop year. The Iowa Legislature has not changed state law on some fees the state Department of Agriculture Land Stewardship Pesticide Bureau charges licensed pesticide distributors and applicators. In other instances, applicators do not take continuing education classes in the same year they apply. Explanations exist for some of the concerns. For example, applicators take continuing education after harvest and before the next spring’s planting season during what is called the crop year, which runs Oct. 1 through Sept. 30, instead of the calendar year when they apply for a license. 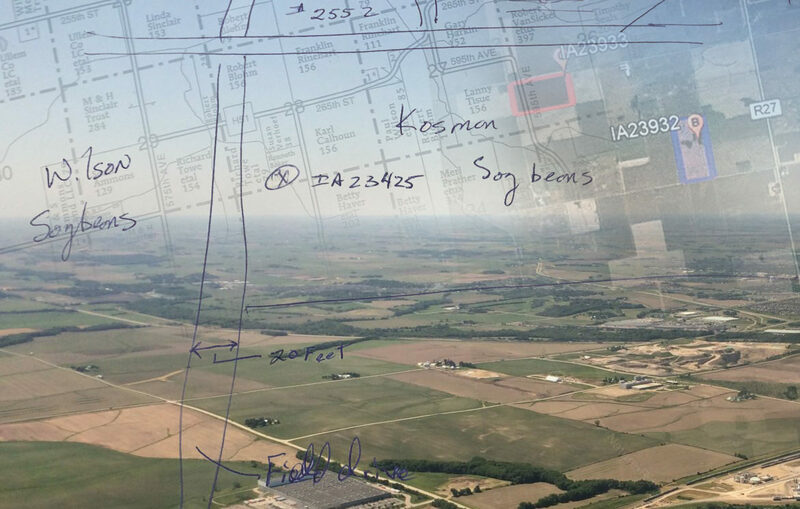 However, the absence of legislative action on the unaligned calendars and other matters in the auditor reports keep concerns alive about how Iowa best can regulate pesticide spraying. The original concerns were in a 2012 state audit of the pesticide bureau and in reports and recommendations to the Department of Agriculture and Land Stewardship each year since. State law says private, non-commercial pesticide applicators may take six hours of continuing education in the years they have been applying pesticides in order to keep their state certification after passing a three-year certification test. But the continuing education for third year of that certification period gets pushed into the next year, after certification has expired. Pesticide bureau-approved classes for private applicators are offered in January through April, after a harvest that keeps farmers in the fields but before the next spraying season. Bureau administrative rules allow that as a practical matter. The audits also said Iowa’s pesticide bureau should have more than one person to update applicator licenses and to oversee collection of inspection fees paid to the bureau. Some of those fees, which cover a small part of the bureau’s operation, haven’t been raised for almost 30 years. Paluch said a lot of the changes necessary to address the reports’ concerns would require statutory changes and are out of her bureau’s control. They include raising fees for bureau services or adjusting dates in the code to better work with the bureau’s practical schedule for re-certification exams. However, State House Agriculture Committee Chairman Ross Paustian (R-Walcott) said no legislation is pending to address the pesticide bureau in the 2019 session. wrote in an email to IowaWatch. on what appropriate fee levels should be. The pesticide bureau received 338 complaints for a variety of reasons, ranging from pesticide misuse to requiring information assistance, from Oct. 1, 2017, through Sept. 30, 2018. The bureau decided that 251 required on-site investigati0ns of pesticide misuse during that time. Licensed private applicators — individuals looking to apply regulated pesticides on personal property or their employer’s property — operate with a three-year license. After taking the initial examination to obtain a license, applicators may renew them every three years through an examination. Or, the individual may elect to take two hours of continuing education courses a year to maintain the license, pursuant to Chapter 206.5 of the Iowa Code. Licenses and certifications expire Dec. 31, according to the code. The 2012 audit showed that the pesticide bureau’s practice is to administer the continuing education for private applicator certifications between January and April, so applicators fail to meet the requirements of completing six hours of continuing education within the three-year license period. It works this way: an individual who passed an exam and received an initial private applicator license in March 2016 could apply pesticides through December 2018. If that person wanted to maintain the license through continuing education courses, he or she took courses when offered in the springs of 2017 and 2018. But the last continuing education course is available now, in 2019, after the license expired for failing to complete the six hours before the license expired. Taking the last two hours now is allow by the pesticide bureau’s administrative code 21 IAC 45.22(5), which states that the renewal period for private applicators ends on April 15 of the calendar year following the expiration date. “That program actually operates on a different year,” Paluch said. “It does not operate on the calendar year. It operates on a modified year due to the fact that farmers work in the field,” she said. The audit report recommended the pesticide bureau reconcile the differences between the state code and the bureau’s administration, but the 2017 report again showed the practice had yet to be rectified. The bureau’s response to the state auditor’s office in the 2017 report said changing the administrative rules would affect more than 23,000 people and the bureau’s education and certification programs, and would take more than a year to go into effect. Office of Auditor of State, State of Iowa. Report released Aug. 15, 2017. 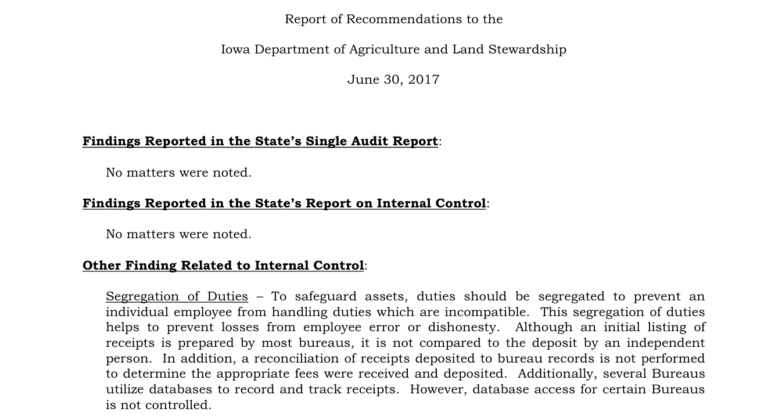 The Iowa auditor’s report covering the Iowa Department of Agriculture and Land Stewardship’s Pesticide Bureau found no major matters but expressed concerns about segregating duties and notes that the bureau is not fully funded with inspection fees. The 2012 state audit also showed that the cost of operating the bureau exceeded fees the bureau charges for its work. While the fees are not the bureau’s only source of income, the audit pointed out the fees had not changed since 1989. A few since have increased but income from all of the fees, other than dealer license fees and registration fees for products, go to Iowa’s general fund, not the pesticide bureau. 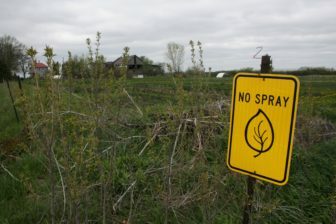 A sign warning pesticide applicators to avoid drifting or accidentally spraying his land. Photo taken in northeast Iowa. Fees for the pesticide bureau are set by law in Chapter 206 of the Iowa Code. The bureau collects fees for commercial pesticide applicator licenses and certifications, dealers for pesticide retailers, registration of individual products that have to be registered at the state level, certification for private applicators who want to apply restricted use pesticides and civil penalties for misuse. The bureau retained $43,350 in fees in fiscal 2018, which ended June 30, Dustin Vande Hoef, the agriculture and land stewardship department’s former communications director said. That was less than 2 percent of the bureau’s $2.6 million budget. An additional 69 percent of the bureau’s budget came from the state general fund and 29 percent from a U.S. Environmental Protection Agency grant. Vande Hoef said the bureau has in the past requested more funds from the state to support its budget, but little has been done to restructure how the pesticide bureau is funded. “In general, the Legislature has not been interested in changing that structure, especially if there would be an impact on the state’s general fund,” Vande Hoef wrote in an email to IowaWatch, before leaving his position with the department of agriculture on Jan. 4. Paluch said civil penalties for pesticide misuse only apply to commercial pesticide applicators, or individuals who may have applied a pesticide to a drinking water source. The maximum fine for pesticide misuse in Iowa, as stated by 45.102(4) of the Iowa Administrative Code, is $500, which Dennis Fett, an non-conventional farmer in Minden who raises peacocks, said is nothing more than a slap on the wrist. Fett filed three pesticide spray-drift complaints with the bureau in summer 2018. The complaints are grouped by the pesticide bureau as one complaint case that has yet to be closed. Fett said he has contacted his local Sen. Tom Shipley (R-Nodaway), who is on the Senate Agriculture Committee, as well as Secretary of Agriculture and Land Stewardship Mike Naig, in the hopes of getting the Legislature to review the pesticide code in the 2019 legislative session and raise the civil penalty fines for pesticide misuse incidents. “They don’t have enough laws, or teeth in their laws, to discourage misuse,” Fett said. Harsher penalties such as other states impose, could generate more revenue for the bureau, Fett said. Nebraska’s Pesticide Act for example, issues $15,000 maximum civil fine per occurrence of an incident violating the act’s rules and regulations. Illinois’ Pesticide Act details a point system to issue fines between $750 and $10,000, determined by how the act is violated and what happened as a result. House File 617 passed in the Iowa 2017 legislative session made adjustments to the cost of dealer license fees, which the pesticide bureau gets to keep. It also removed a part of the code that allowed dealer licensees to choose to pay one-tenth of 1 percent of their gross pesticide sales if they sold less than $10,000 in retail sales. Now, these dealers must pay $10 for a license. 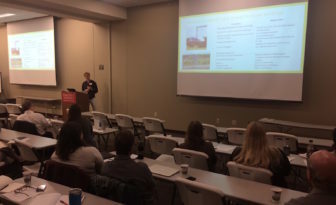 Environmental researchers gather at a May 14, 2018, conference in Iowa City to share research about pesticide management. The bill also raised delinquent fees for licensing fees from $10 to $25, or the cost of the original license fee if the gross pesticide sales are over $100,000. Applicator license – A license of not more than $25, as determined by the secretary of agriculture and land stewardship. This was last updated in 1974. Applicator certification – For a commercial applicator, or someone who receives compensation for applying pesticides to another person’s property, $30 for a one year certification or $75 for a three-year certification. For a public applicator, or someone who is employed by a governmental agency to apply pesticides, $10 for a one-year certification and $15 for a three-year certification. This was last updated in 1987. Private applicator certification – $15 fee for a three-year certification. This was last adjusted in 1989. Cunningham said the agriculture and land stewardship department could take some steps to adjust its fees. Staff reporter Lauren Wade’s work on this story was supported by the University of Northern Iowa Science in the Media project and the college student IowaWatch-Science in the Media fellowship program on which it collaborates with IowaWatch.